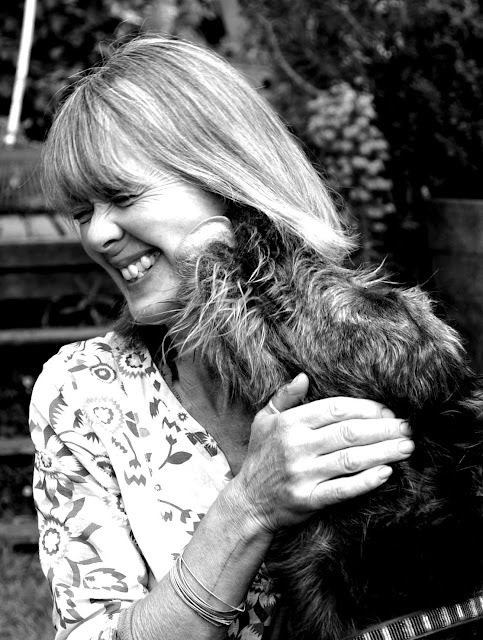 Linda Coggin is an actress, poet, author and animal lover. Her latest book, “The Dog, Ray” is a novel about a twelve-year-old girl killed in a car accident. She briefly visits “heaven” – a Government-run job centre – only to find herself returning to earthly existence in the body of a dog. I thought I could predict exactly how the plot would turn out, but it surprised me. And the book provides some interesting insights into the human-animal bond. Linda was happy to chat with us. Linda Coggin with one of her muses. I don’t really have a day job. I write! But sometimes I make gardens for people. I have had lots of day jobs in my time though. I’ve been a mime, tv presenter, actor, stylist, gardener and cleaner. But I have always written. Can you give us a short synopsis of your book The Dog, Ray? 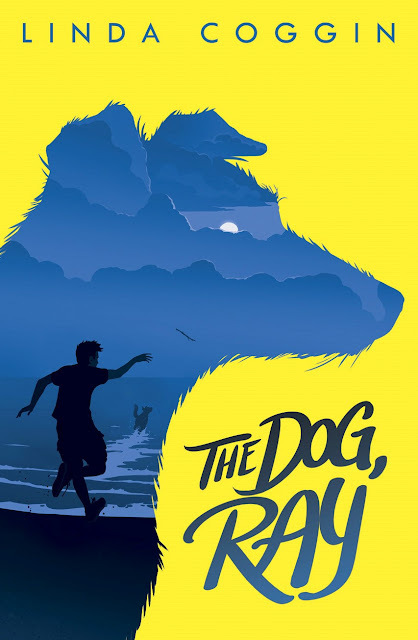 The Dog, Ray is about a twelve year old girl called Daisy, who dies in a car crash and comes back to earth as a dog. But she retains the memory of being her twelve year old self so has opinions and attitudes and ideas that no one can understand. She meets a boy who is living rough called Pip, who gives her the name of Ray, and together they go on a journey to find his father. You wrote that your dog Beezle was the inspiration. How did you meet Beezle and what about him inspired you? Beezle is nearly thirteen, about the same age as the girl, Daisy, in the story. We have had him since he was a puppy. His mother was a lurcher and his father a very handsome whippet. 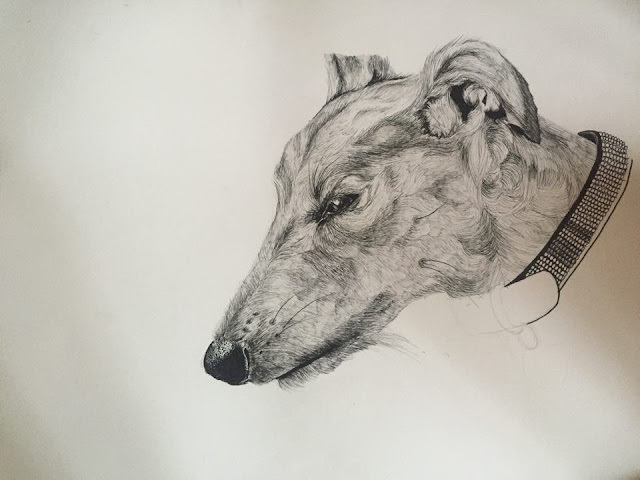 Beezle, as drawn by Linda's daughter Chloe. Beezle let me into the world of dogs. He is always busy just being a dog. He likes chasing things, burying things, chewing things, having his head stroked and lying around a lot. He is a very gentle, loyal dog and because I’ve spent so much time with him I’ve been able to observe the important bits which I hope make Ray in the story believable. Like how his ears move. Beezle’s ears are very expressive. Beezle with his expressive ears. Your book highlights the ways (good and bad) that different people treat dogs. How do you think we should treat dogs? I think we should treat dogs in the same way we should treat any sentient being. With love, kindness and respect. Never to punish but to show them what you think is right and to praise them when they do well. I think dogs can easily behave in the same way as their owners. I’ve seen nervous, neurotic dogs with nervous and neurotic owners. If something goes wrong with a dog’s behaviour it usually comes from the owner. What other non-humans do you share your life with and how did you meet? 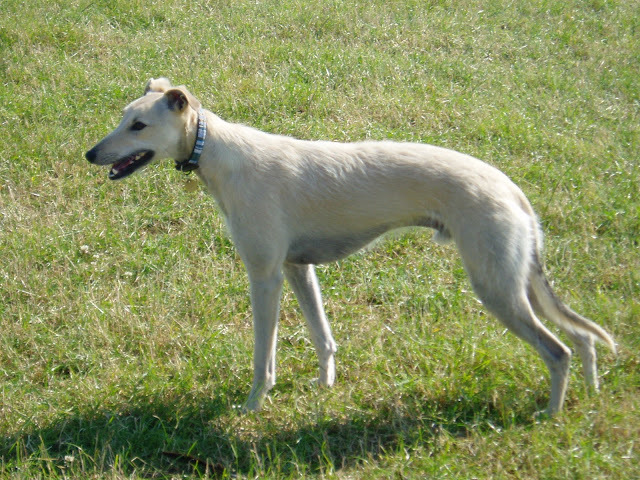 As well as Beezle, we have an Irish wolfhound called Pixie, who does not behave like a dog and was no good at inspiring dog like things for the book. Although she is very large, in her mind she is a lap dog. We also have two cats, Pocket (quarter Bengal) who features a lot in my blog as he’s always bringing some dead animal home. Well it’s usually alive when he enters the threshold through the cat flap. Also a black cat Nancy who we rescued. Then there are two horses, Harry a gypsy cob and Trude a rather aloof Friesian and seven Indian Running ducks. Last year we had a pet rook too who had fallen out of a nest. Advice – oh! Only that I’ve learnt to try and be calm around animals. To be patient and non-threatening and not to force anything. We all have to gain their trust. Thank you Linda. The Dog, Ray is published by Hotkey Books and available for $16.99. You can read more about Linda on her blog lindacogsblog.blogspot.co.uk, Facebook pages (The Dog, Ray; The Boy with the Tiger’s Heart; Linda Coggin), and follow her on twitter @LindaCoggin.